i-50 is improved accuracy repeatedly in the adoption of Patent No. 5133884. NS Tool Setter makes it possible to measure the tool length (the position of a drill tip) on the machine tools. It saves your machining time! Sub-zero treatment and ultraprecise polish prevent the variation across the ages. It is usable to measure iron and nonferrous metal workpieces. Tool Setter-i has been developed for ultra-highspeed spindle with the machine tools (10000rpm). It is available to measure plastic, wood and some other materials which block electricity. Magnets are attached at the bottom, so it can be used with both vertical and holizontal machining tools. Input error is one of the causes of runaway accident. Let the automatic input in the tool setter. Tool presetter is no longer needed for measuring the tool length! 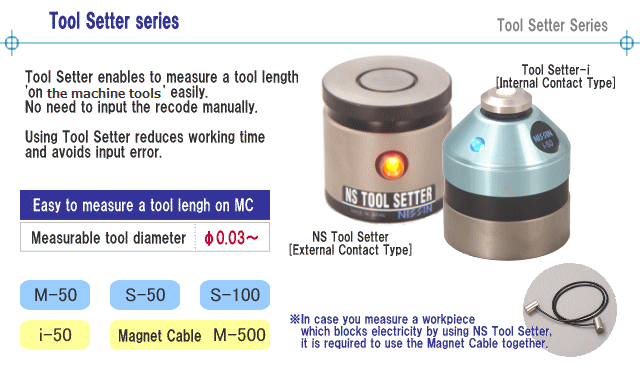 With Tool Setter series, working time can be cut dramatically and no more input mistake will happen. Put NS Tool Setter on the table and lower a spindle as indicated above. CRT display recodes the position where a tool edge touches. Reset the recode when the tool #1 touches to Tool Setter. Lower tool #2 and input the recode L (the difference from tool #1) to offset. Lower the tool #1 from the machine datum and measure the distance Z1. Measure the distance Z2 in the same way, and get the offset.